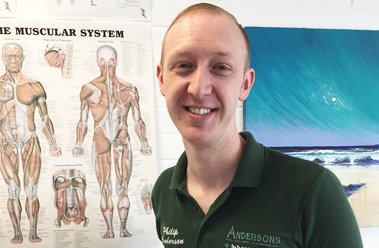 Hello and welcome to the Andersons Injury Clinic website, my name is Philip Anderson and I am the proprietor of Andersons Injury Clinic in Limavady, Co Londonderry, Northern Ireland. I treat a range of soft tissue injuries including back pain, shoulder pain, sports injuries, ligament and tendon pain, tension headaches, pulled/tightened muscles and more. The main problem that I treat is lower back pain.